As the first newsletter of the new millennium, the committee and myself wish all broadsword members a belated Happy New Year. It has been a busy last few months. I have received plenty of letters, invitations to attend functions and a number of interesting phone calls over the Christmas period. I would like to take this opportunity to thank everyone for their Christmas cards, too many to mention but much appreciated. Thank you. The reunion should now be fixed firmly in everyone's minds. It is due to take place on 17, 18, 19 NOVEMBER 2000 and with that in mind, would the forty or so members not yet paid up for the year 2000, please send a cheque as soon as possible to Alan Rogers, the membership Secretary. We have had a letter and a newspaper clipping sent to us from the Falkland Islands memorial Chapel Secretary. If you remember we donated a sum of money collected at the last Reunion at Chester for this worthy cause. "The Chapel, sited at Pangbourne College, Reading was officially opened in March. The Chapel was eventually built after five years of fund raising. The building was designed by Crispin Wride Architectural Design Studio, following a nation-wide competition that attracted 73 entries. The almond shaped building, poignantly reminiscent of a ship, allows the light to "wash" down the walls into the main body of the church from the glass surround in the roof, giving the interior a feeling of space and optimism. 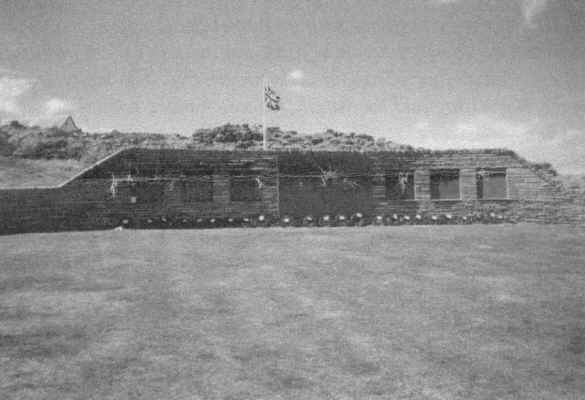 The names of the 255 servicemen and 3 women civilians who lost their lives are listed on the stone plaques which flank the entrance and are listed in more detail in a leather-bound Memorial book which is on show for visitors. Embroidered kneelers - made by hundreds of volunteers throughout the UK - each bear the name of one of those who died. In the memorial rooms, visitors can trace the name of a fallen friend or relative on the South Atlantic Medal Association web site, view photographs of the Falklands and the 2 murals painted by Linda Kitson, the official artists to accompany the Task Force. The Education Room charts the history of the war and the islands through a wall mounted timeline and interactive, backed by a list of reference books. The landscaped area outside the Chapel - planted with tees, shrubs and grasses found in the Falklands - includes an unusual circular brick built memorial garden with a private seating area and water flowing over a map of the Islands carved in granite. The generous gift of land from the Governors of the College has allowed the Chapel to be built in a secure but public environment which still maintains its military traditions and values. It will allow the Chapel to be used regularly for worship and will be truly "living" memorial - not a bleak obelisk on a lonely hill and will ensure that those who paid dearly in the war will never be forgotten". I have also included a letter from ' Dickie Davies ' (Falklands Broadsword) then a Leading Seaman and now a CPO and part of the Devonport Field Gun Crew (World Record Holders). Thanks for the photos and for bringing the record back to Guzz, for all time!!!! My brother-in-law, Richard "Tug" Wilson was also a member of the crew, and believe it or not, also ex-Broadsword. Small world. I would like to thank you for the newsletter and membership renewal form, I have sent my dosh and form away to Alan Rogers already and am looking forward to receiving my membership card. I was glad to hear that the reunion went well down in Chester. I'm sure the breweries around the region are a bit better off now. I did write and let you know why I could not attend, the reason being was me being in the Falklands again on Guard Ship duties between Sept 98 and Mar 99. It was a long slog too. It was in fact the last official ship on patrol dedicated to the Islands, the deployment has now joined up with the West Indies and West Africa Guard Ship for a six month trip. The visits are a bit more interesting and a touch more varied. I thought I would send a few photos from the trip. We were there for remembrance day parade which was very somber and sad; our visit to Pebble Island was quite eerie. We landed by boat and walked for hours up to the memorial of HMS Coventry, cleaned it up a bit and gave it a lick of paint. I took a photo of one of the plaques in Port Stanley that had the name of Andy Barr (A/B(S)) on. 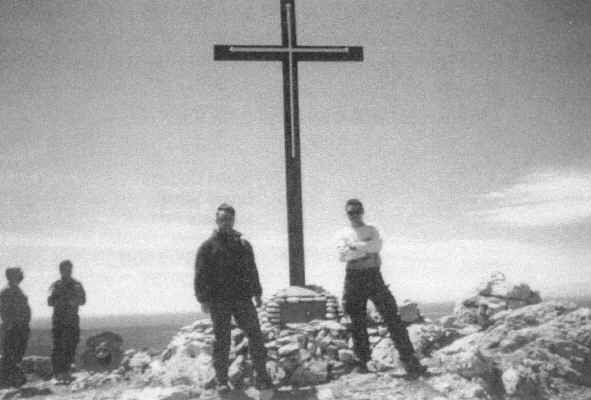 He was an old friend of mine, we joined the Broadsword together in 1979, he then left us to join the Ardent, just before the Falklands kicked off. Sad eh!!! We had some great times on board. Looking forward to the next Reunion - hope I can get there this time! i appreciate all the hadr work and effort you and tanzy have put into the Broadsword association, you have done a good job. Thank you. All the best to you all. Keep the powder cry. 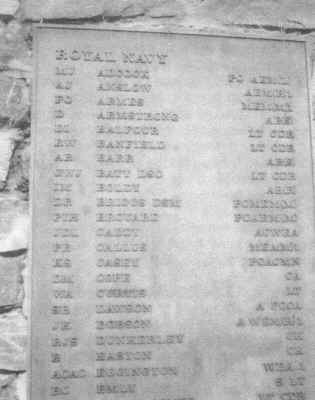 DIED ON HMS ARDENT "LEST WE FORGET"
Next letter from Rick Jones MBE. It was a pleasant surprice to recieve it. Thank you Rick. "BROADSWORD PARK" to go with "Taranto Hill" and "Troubridge Park". A month ago a sign was up on the estate using the name. The ribbon cutting ceremony is this month mby Admiral Blackham. The whole thing is being built and owned by "Western Challenge" Company and run by the Defence Housing Executive. Western Challenge asked me for names for roads in the estate, and this was done democratically by the executive board at Yeovilton, which I was chairing at the time. When they suggested later that the estate should have the name, I just proposed "Broadsword Park", giving no reason for the name. Questions may be asked at the ceremony!! I retired from Yeovilton in Oct 98 and am thus out of the loop but I think this gives you some background information. In reading the page 4 article about the Falklands, it reminded me of an earlier query that I had. The article, and previous similar articles described the small arms batteries that had been set up. The articles never mentioned the GPMG and the 2 LMG's that the flight set up (GPMG on a shock mat on the flight deck, LMG with a bipod on the flight deck guard rail). We had them there for the first day with Coventry off Stanley till at least the 21 May, and SWEO said they were responsible for the bits of Skyhawk/Mirage on the after Seawolf deck on 21 May. Whether any aircraft was damaged sufficiently to prevent it getting home I don't know, but a head on aircraft is an easy target. Whether the guns were manned from 21 May - 31 May I don't know as I had shrapnel through the chin on the second attack from Starboard when the bomb fell just short and I had 10 days on a holiday cruise liner of my choice with the Docs. I think the ships small arms batteries formed after 21 May - who has a record of this? Anyway I shall post this. The Officers know of Broadsword Park from the reunion in June, though Cdre Mowlam had lost his speech notes and forgot to mention it!!! Over the weekend of 13 - 15 November, 83 men from various ships' companies of HMS Broadsword and their wives and partners, visited Chester for a reunion. The weekends programme included a visit to the Royal Naval Association at Cappenhurst, an opportunity to see and shop in Chester, a reunion at the Town Hall attended by members of the City Council and a service at the city's Cathedral. Much of the programme was made possible by the close and on going liasion between the Broadsword Association and the city's Council, and in particular Mrs. Wendy Healis. HMS Broadsword was a type 22 all missile frigate that played a major role in the Falklands War of 1982, receiving much bomb damage after many attacks by Argentine aircraft. The ship had very close ties with the people of Chester, the ships' companies visiting its adopted city on numerous occasions. "Many good friends have been made in Chester and although the ship is no longer with the Royal Navy, having been sold to Brazil, this has not stopped us still wishing to be part of Chester" said terry Lee, the Broadsword Association treasurer. 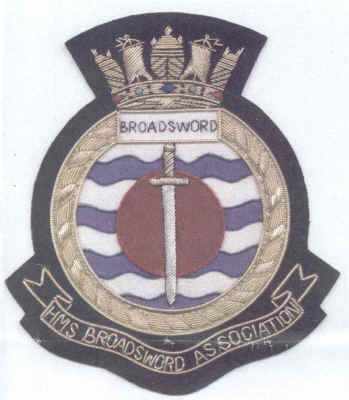 He also said "Broadsword was a marvelous ship and its good name and the comradeship of the men of the Royal Navy live on through the Association. Many old friends met up in Chester over the weekend, some having not seen each other since the harrowing days of the Falklands War". The Broadsword Association Secretary, Mr. Keith Roberts said "We are very proud and honored that the city of Chester is keen to keep its ties with us and we are looking forward to our next reunion in Chester in the year 2000"
Above is a copy of the press release that Terry (Tanzy) sent out to the local newspapers in and around Chester after the last reunion. I can only apologise for the lateness of this newsletter. The National Wine Association is taking up a lot of my time, and the loss of my computer system (not the millennium bug) hasn't helped. Anyway, I wish you all well and look forward to seeing many of you in Chester later in the year.